The 23rd annual Gales of November will be held in Duluth, Minnesota Friday, November 12 and Saturday, November 13. What began 23 years ago as a small gathering of divers sharing shipwreck pictures has grown into a festive two-day educational and networking event. 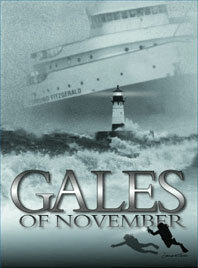 Gales of November features fascinating exhibits, lectures, and presentations. The event often includes sessions on maritime archaeology and historic preservation. This exciting two day benefit is the premiere fundraising event for the Lake Superior Marine Museum Association (LSMMA). Funds raised by the Gales of November Benefit help maintain and protect the maritime history in the Army Corps of Engineers’ Lake Superior Maritime Visitors Center at the foot of the aerial lift bridge in Duluth. For additional information check out the web site.